The countdown is officially on… Only 5 more sleeps (as Em’s constantly reminds me) til the man in the big red suit & fluffy white beard makes an appearance at the Confetti & Curves HQ. Surprisingly enough, this year’s taken me longer than anticipated to find my Christmas sparkle. Maybe it’s the queues of stressed out shoppers, my lack of patience when it comes to waiting for parcels or perhaps (and most likely) it’s down to the fact I haven’t had my Christmas tipple to officially declare the festivities open. Hopefully, all that will change this evening as schools are now off for the jolly hols which means it’s ‘okay’ to pour an extra large glass of something fruity and whilst flicking trough the channels to find a cheesy Christmas film. However, to feed my obsession with all things sparkly, I took to giving my nails a bit of a seasonal makeover. Now although I’m not usually a fan of ‘themed’ nails, I’d be a bit of a nail grinch if I didn’t at least do a little something to get my fingers feeling a little more festive… it also gave me an opportunity to test out a few of my newly acquired goodies from my Secret Santa Swap Box – if you haven’t already seen it yet then *click here* to take a peek at what was inside! The nails are actually a very short acrylic sculpt, as this year I’ll be hosting dins for all the family so I needed a length that won’t cause any mishaps with the turkey *rolls eyes* The gel polish colour I opted for is a vivid red by Saint Nails. Their range is fantastic for longevity when painting over acrylic, it’s also a great price point for nails techs looking to build their range of gel colours without breaking the bank! For a fun, but simple Christmas inspired design I couldn’t wait to test drive my fancy schmancy Born Pretty BP01 plate. I just love the cute little snowflakes, that look really eye catching against the bright red gel! For a fun feature nail I opted for a simple little Santa hat! The red and white go perfectly with the above snowflake design, not to mention the fact it’s fun and super easy to do! I opted for Saint Nails gel polish over my acrylic overlays, however, this would be easily achievable with standard polish – just be sure to allow the layers drying time before top coating to help avoid any smudging! So there we have it gals, I’m all ready for Christmas with my festive themed nails… I’m pretty sure they’d get Mrs Claus seal of approval too! 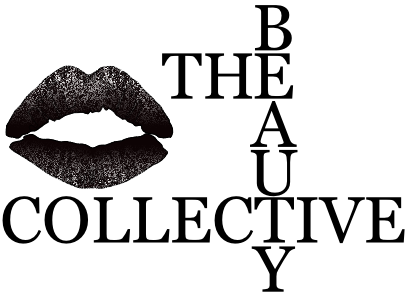 The Beauty Collective…. What Do YOU Wanna Know? Fancy taking part in something exciting? Course ya do! Wanna interact with others? Meet new blog buddies? Find out what makes your fellow bloggers tick? Then why not roll up your creative sleeves and take part in an exciting new mini-series The Beauty Collective! Okay, bit of a back story for those of you who’s ears are perked and eyes are peeled… As you can see (up along the menu bar on Confetti & Curves) there’s an intriguing little tab entitled ‘Behind The Blog‘ – this was a series of fun weekly interviews that a whooooole host of fabulous bloggers took part in over a two-year period. The point of it? To allow the rest of us nosey bloggers to learn a little more about you & your fabulous corner of the interweb. Of course after taking a break from Behind The Blog I’ve been inundated with emails from new bloggers asking if it’ll be making a return. However, fear not my little computer companions as it’s high time we started afresh – and YOU have control in choosing the questions. 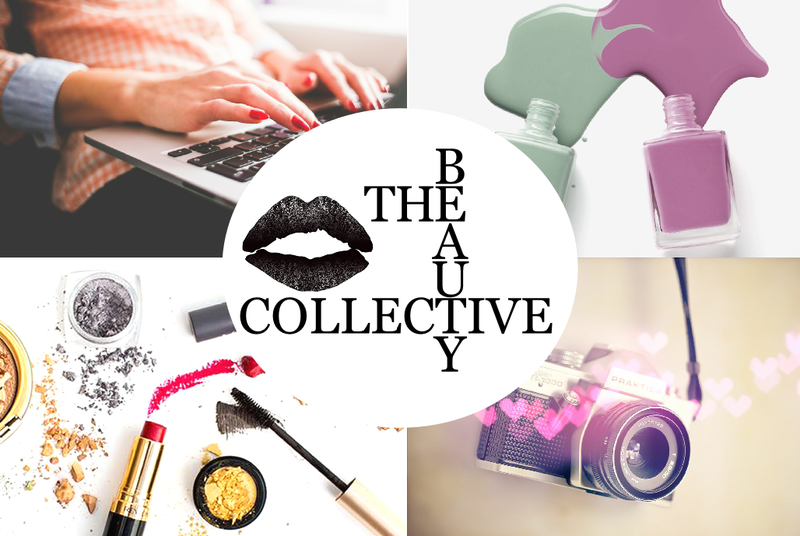 For those eagerly waiting to take part, feel free to submit a question and if YOU would like to be a featured blogger on The Beauty Collective leave your details in the comments below & I’ll be in touch with more info very shortly. 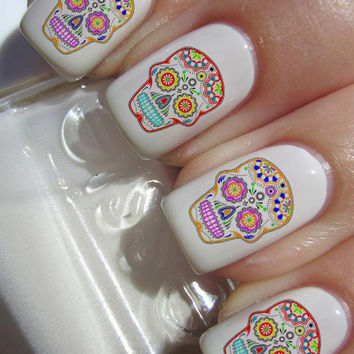 I’m currently obsessed with browsing over intricate little nail designs, which is no surprise coming from a nail tech. Pinterest, Instagram, Google – I could spend hours sifting through the hoards of awe inspiring nail designs. However this Halloween I’ve a few clients who are super excited to get their talons transformed into something rather spooktacular! Cute, fun and best of all an easy peasy nail art project for virtually any skill level. 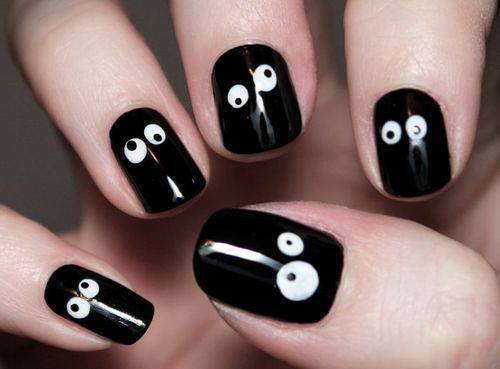 All you need is some good quality black & white polish, along with a dotting tool, and hey presto – you can create your very own little spooky eyeballs! 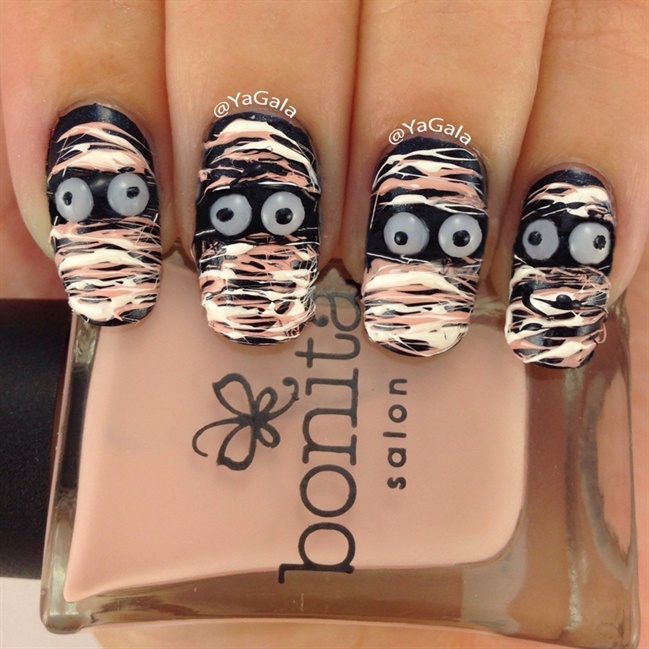 How hilarious is this Egyptian mummy inspired nail art by YaGala?! I love the little googly eyes that give it such a fun 3D quality – definitely one I’ll be trying out over the next few days! Wow!! I adore this cute little Haunted House scene from Stylish_Mom. 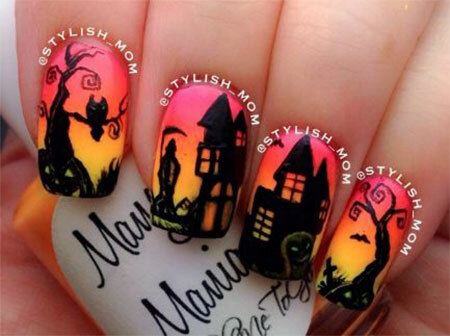 That gorgeous matte ombre effect finished off with such intricate hand painted designs makes this the perfect eye-catching illustration for any trick or treater! 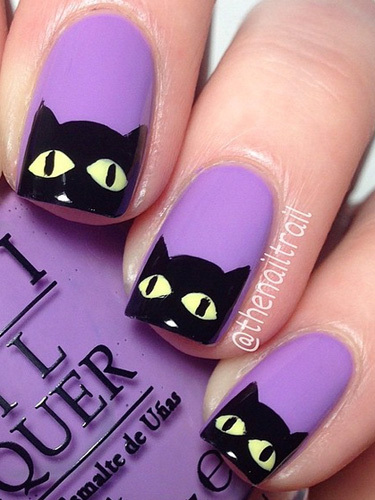 No Halloween nail art collection would be complete without the universal accessory of spookiness – the illustrious black cat. I love the purple background and cute kitty’s face peeking over the free-edge created by The Nail Trail. This is definitely one to etch onto on my to-do list!! How fabulous is this chic spiders web design? However, fear not fellow shaky-handed folk as there are plenty of Halloween themed stamping plates to help you achieve the same precise detail without having to be a modern day Picasso! 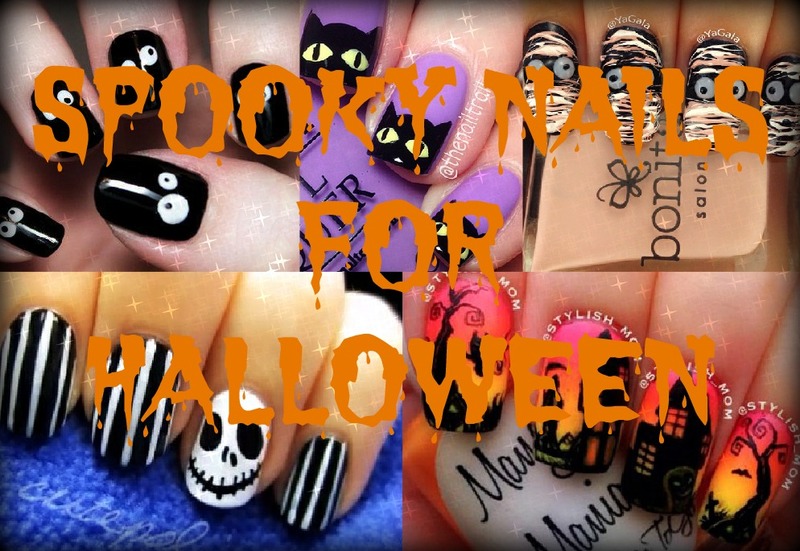 Obviously, I had to include a nail design of one of my favourite Halloween characters’ – the fabulous Jack Skellington. I’m head over heels for this work of nail-art by Cute Polish… and it looks pretty easy to recreate. It’s certainly inspired me to give it a go! Oooh erm, hello Tuesday…. it’s been a while since I slipped from my normal routine, however with what feels like half the house turned upside down from re-decorating at the moment, it’s no surprise that I’m thrown into domestic chaos – and so is the blogging routine until the paint brushes are fully packed away again *sigh*. 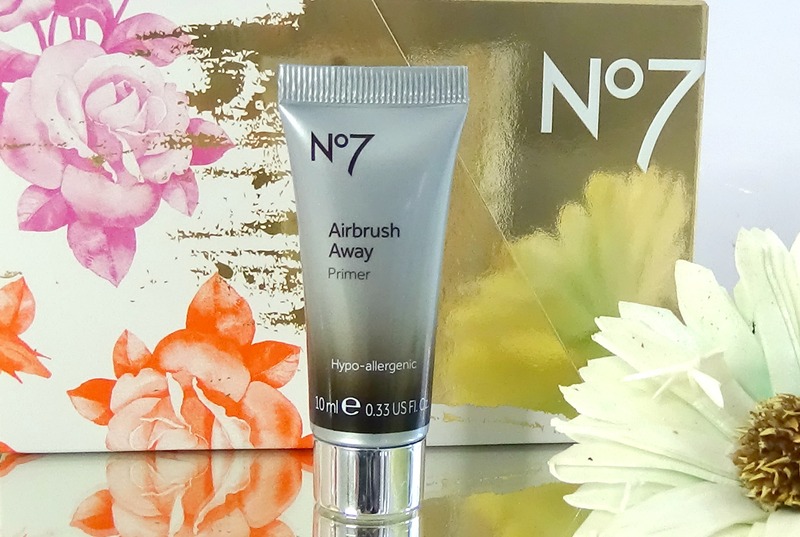 “No7 Airbrush Away Primer for days when you want your skin to look flawless and your makeup to apply perfectly. Pores and fine lines appear to disappear and wrinkles are put into soft focus leaving your skin perfectly smooth and even all day. 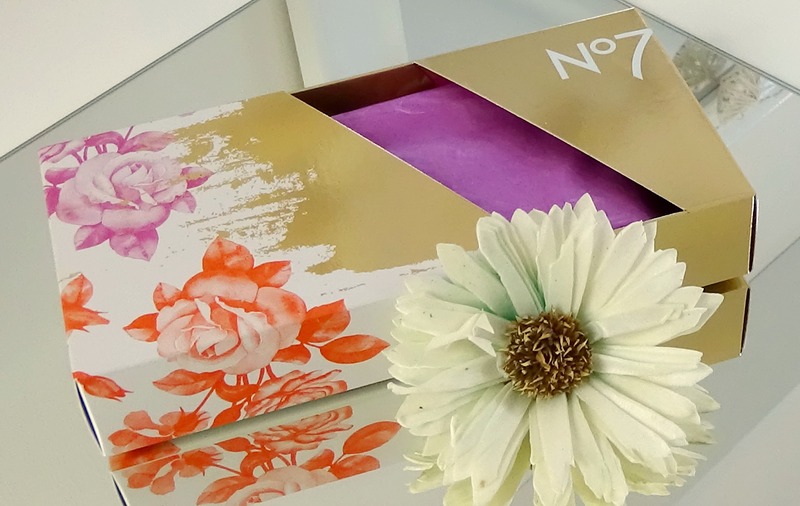 Personally, I’m a huuuge fan of the No 7 primers and this is no exception. With its silky texture that doesn’t leave your skin feeling oily, Airbrush Away helps to smooth out imperfections allowing your foundation to appear slightly more airbrushed and flawless. 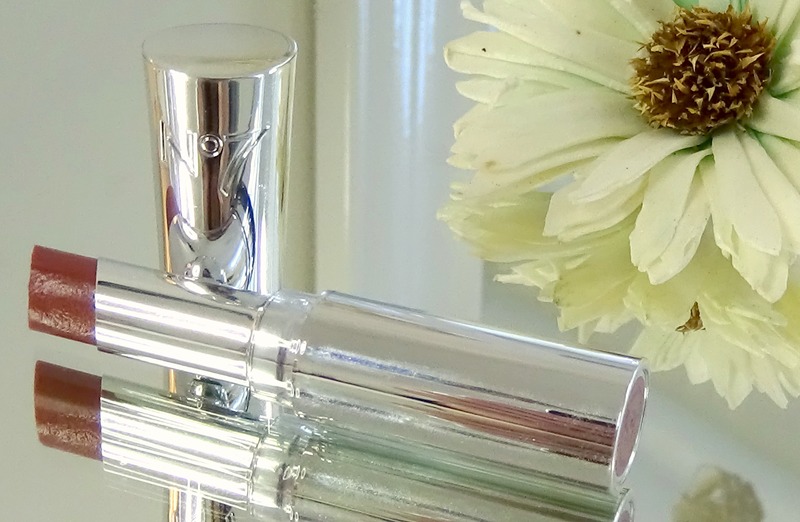 It glides on like a dream and makes a considerable difference to keeping your makeup looking fresher for longer. Say goodbye to parting with unnecessary wads of cash for a decent primer, as for £16.50 this is definitely an affordable investment – and a little goes a loooong way ladies! It’s definitely worth the spend! “No7 Stay Perfect Eyeshadow delivers high impact colour. Blends effortlessly and lasts for hours. 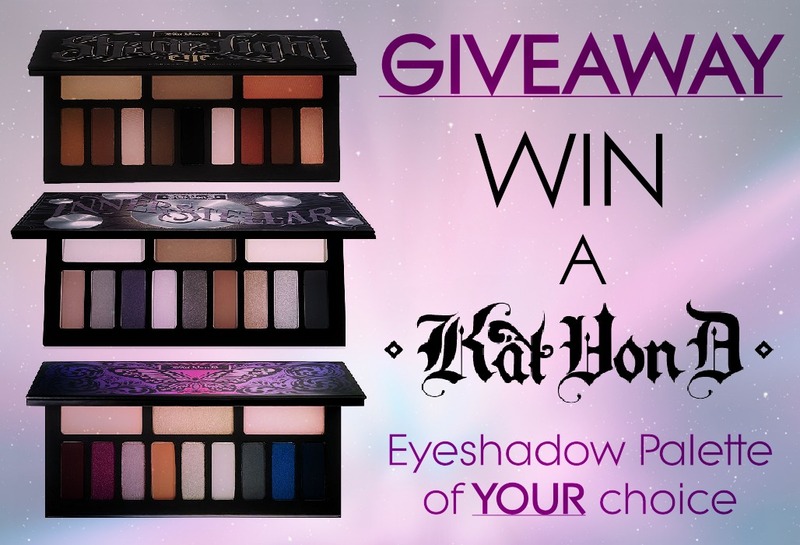 As many of you already know, I’m a bit of a magpie when it comes to eyeshadow – the more shimmer the better. 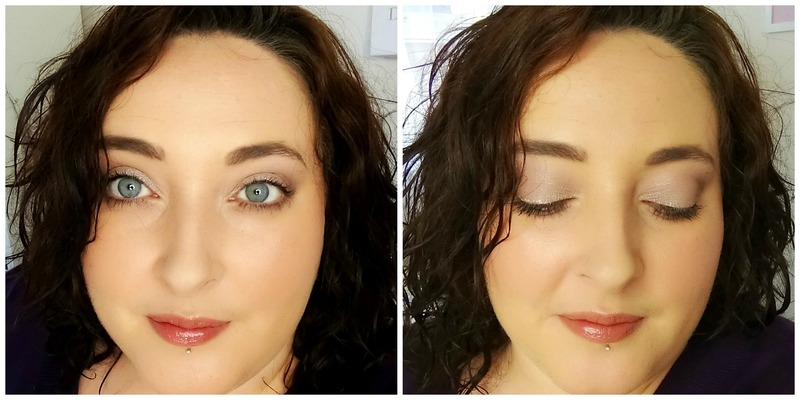 If truth be told… if you take a peek into any of my palettes you’ll notice that the matte selections are barely touched, so needless to say I was a little sceptical when it came to imagining me falling head over heels for this particular formula. 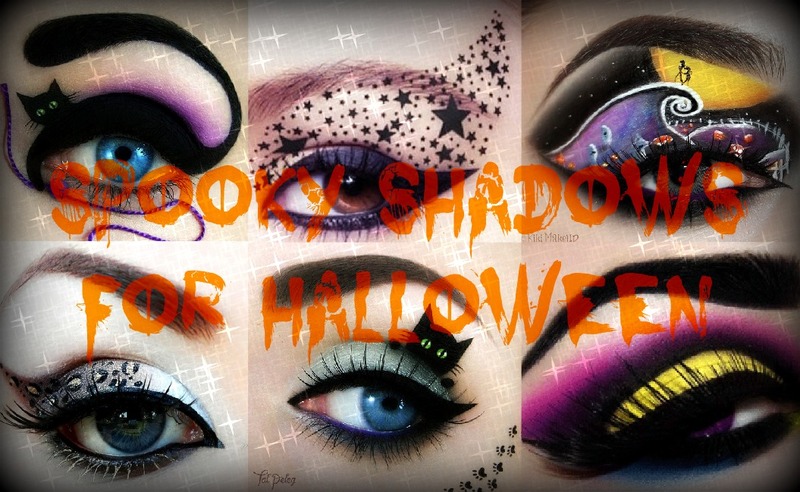 Okay, so it hasn’t got the glam of my beloved shimmer however this is a gorgeous shadow that truly deserves the praise. It may not be over dazzling in appearance but this beautiful warm grey is a gorgeous colour that works incredibly well with so many other tones (I’ve found it especially fabulous with plum tones!!) Just as I’d expected from No 7, it outlasted my expectations. I applied this at 10am and by 6:30pm it was still looking fresh and well. At £7 it’s not the most pocket-friendly of drug store options however its endurance makes the spend completely justified. Available in 22 individual shades or you can buy the trio’s – one thing I will say is that this particular shade (mocha) is a fantastic staple for anyone! 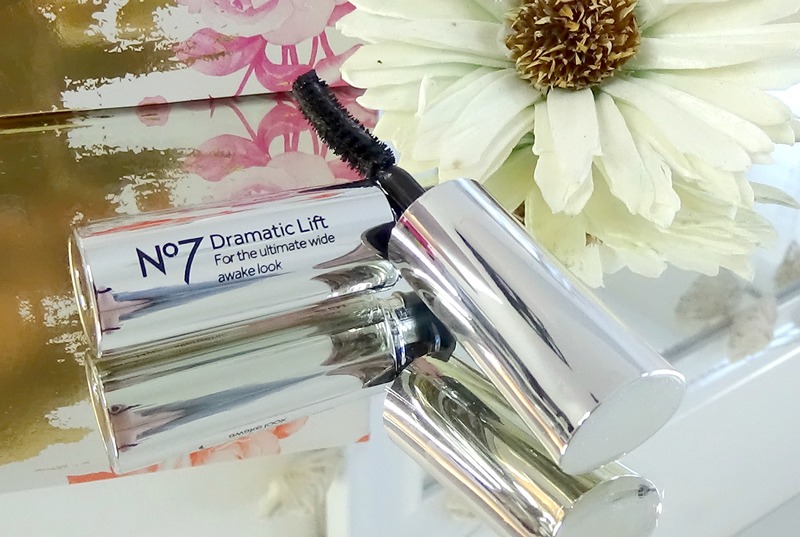 “Inspired by haircare, No7 Dramatic Lift Mascara contains flexible polymers and Keratin to help boost lash from root to tip. Wand Style- A curved styling brush that fits perfectly in to the roots of the lashes to help lift each individual lash to create the ultimate wide awake look. “Colour glides easily over the lips, creating a shiny lipgloss effect without any stickiness.. Now we’ve added some gorgeous new bang-on-trend colours to the range, perfect for a subtle daytime look or more dramatic evening lips. Tucked inside the little box of goodies was a lipstick voucher for a Sheer Temptation Lipstick. I opted for the shade Caramel Kiss… which seems to be a bright pink on the website – yet nothing of the sort in reality! So as you can imagine by the name of the formula this is certainly not a heavy matte concoction, but instead, a beautiful lightweight lippy that feels incredibly nourishing and kind to your lips. There was no bizarre taste, no nasty stickiness – just a smooth & silky coating of lip colour that felt intensely hydrating to wear. Of course being a sheer lippy it doesn’t have overly lengthy staying power, though I managed to get about 2.5 hours out of it – which in my humble opinion isn’t anything to grumble about for something that feels so nourishing to wear. Okay, so you may have to reapply, but honestly gals, once you feel how soft this is on your lips you won’t have any hesitation to pampering your pout a second time round! No 7 continuously seem to impress me the more I dip into their product range. I started a number of months ago with their Beautifully Matte foundation and since then I’ve been hooked. 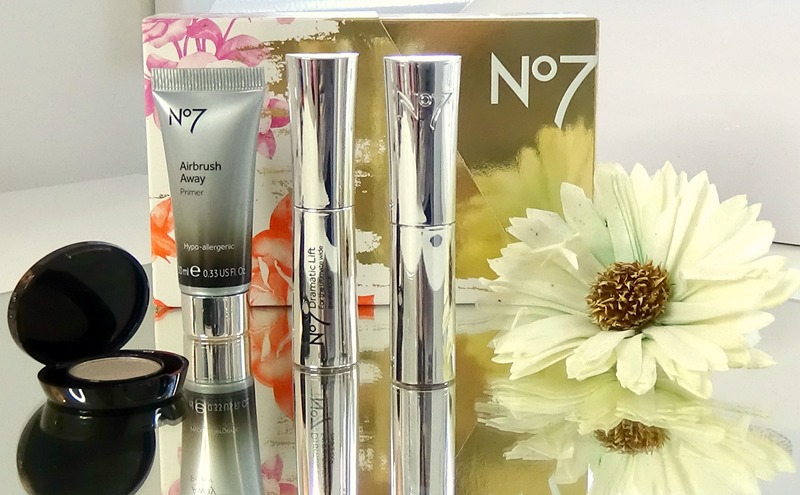 Considering this was a freebie gift set that has a great range of goodies to suit everyone, I’d certainly recommend any makeup maven yet to try No 7 to pop into your local Boots store and give them a go. The staff have always been so incredibly helpful, so if you’re not sure what you’re looking for don’t worry as they’ll certainly keep you right without seeming pushy! I love the final look and this is definitely a great range of staples I’ll enjoy using as part of my daily routine. 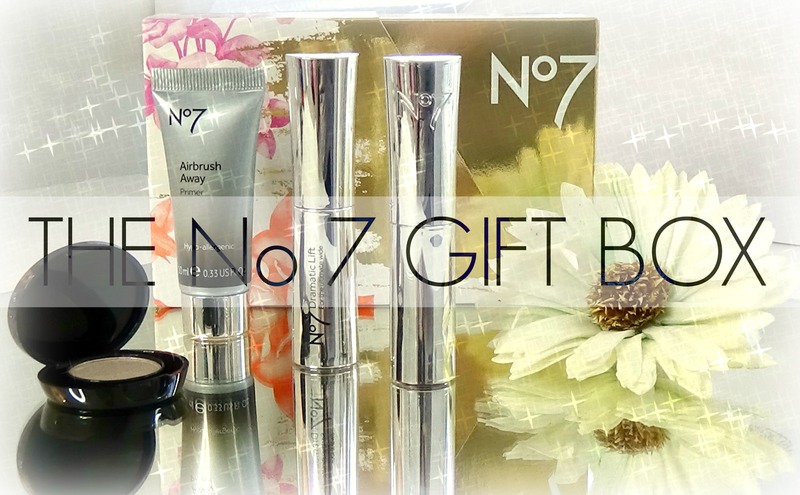 Thanks No 7 – you’ve converted me once again to even more of your fantastic range! 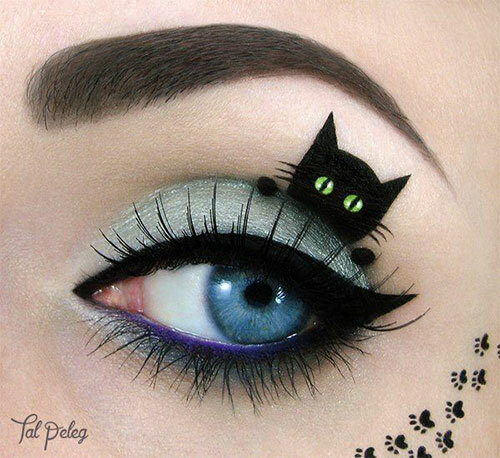 How cute & quirky is this fantastic kitty design by Tal Peleg? I adore the subtle green base, slender liner and simple illustration… and the teeny little paws finish it off purrrfectly. Although I’m quite often found designing animal prints on nail art I’m yet to try it on my lids, thankfully this design is actually pretty simple to recreate so you don’t need to be a Picasso to master the craft. 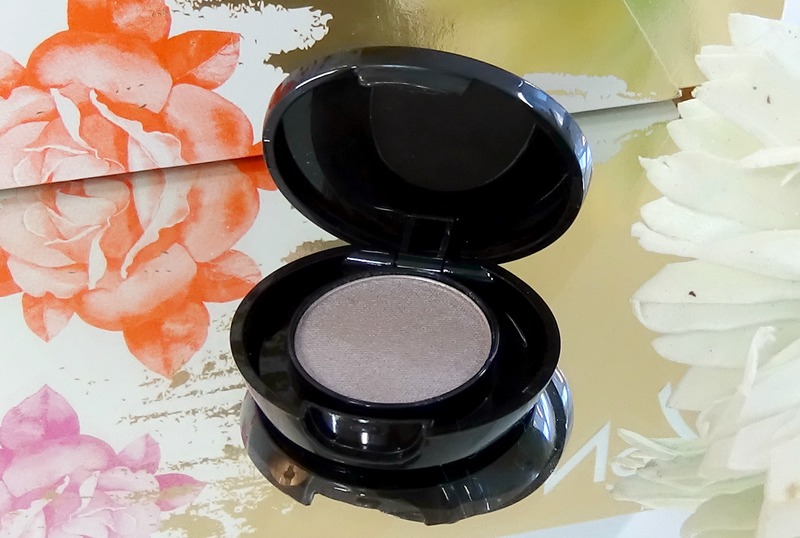 A gorgeous smokey shadow, vibrant inner lid & viola your base is done. 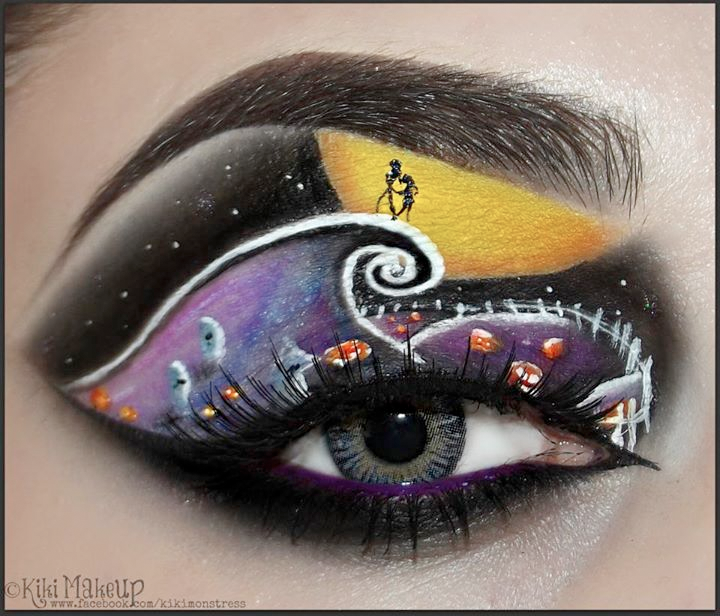 I love the whispy lashes too – not too overdressed & lets the artwork speak for itself. 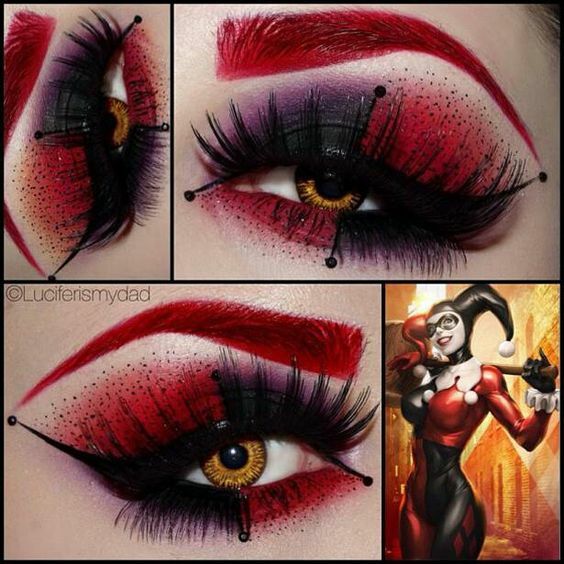 It’s pretty safe to say that this year Halloween parties across the globe will be awash with Harley Quin costumes, however this animated inspired look is super eye catching & works a treat with the vibrant red brows and long playful lashes. 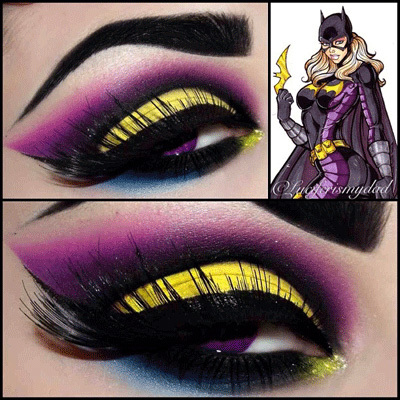 Sticking with the Batman theme, I adore the pop of bold colours so brilliantly used in this fabulous Cat Woman inspired shadow design. That gorgeous blended purple & super sharp cat line is on fleek 😉 not to mention the stunning purple contact lens and feather lashes to create a dramatic look that’s bound to catch a few eyes! It may not be the most colourful but I absolutely adore this fun star-trail design! 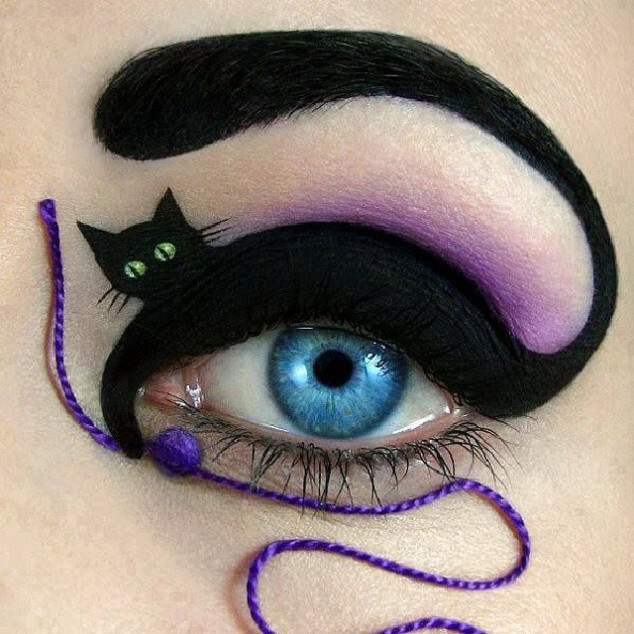 It’s simply the perfect way to dress up your eyes without needing a masters degree in art & design!!! 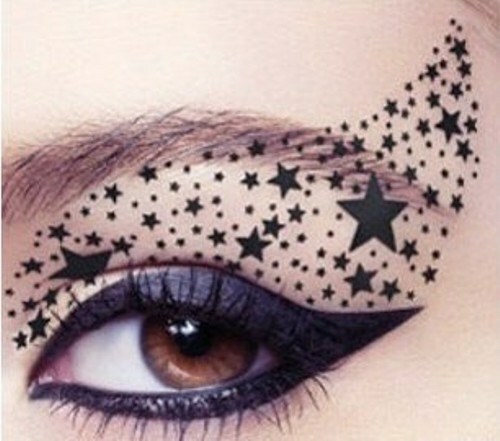 Better still, you can purchase temporary eye tattoo’s to achieve this look (and many others) without having to spend hours creating a mini galaxy… check out Anteatersink on Etsy for lots of great temporary eye tattoo designs! Being a maaaahoosive cat fan I simply had to include this final awe-inspiring kitty design, complete with its own little ball of yarn and string. It’s adorable in every way – maybe not the easiest to recreate, nor the most stay-proof for an all night spook fest, but it’s utter genius none the less! Love it!